Koolassjoe is a Gamer. A True Gamer. An Old School Gamer. My PSN is... Koolassjoe. this here is a collection of video game music that Ive arranged and sampled from - in conjunction with my MTVMG addiction. People get confused when they ask me "How do you make your beats...?" and I reply "With my playstation!" But true gamers love it. Especially the beats that originate from the games themselves. So heres a little taste of my Gamer past, present & future. I hope you enjoy! 2 - The Dungeon Loop // NES - Super Mario Bros.
To complete the albulm, I've linked a few tracks for you that have been chilling in the backgrounds! In essence, it's being released here... The International Music Generator Users Lounge. Listen, comment, rant and rave. Should ya friendly neighborhood KOOLASSJOE keep the music flowing???? I created this idea a couple months ago and i figured you guys should check it out! This is the idea's section of the playstation blog where the playstation community gets to cast their ideas to sony & the rest of the world. I do believe you have to create an account to vote and i tend to forget that im an american and TIMGUL is International so this is the "US" playstation.blog share site. In the real world, an MTVMG1 HD Remix is one of my wishes. Koolassjoe presents China Rewind. Tends to stay in ya head for a while and is one of my favs. 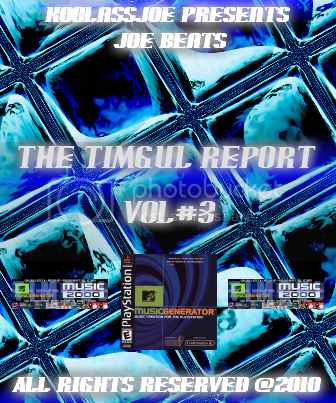 This track produced on MTV Music Generator for PS1 can be found in the TIMGUL Report vol#1 for download. Albums / The TIMGUL Report poll! And as for this poll... i really dont know how these polls work (LOL) but any criticism is fully appreciated. thanx 4 listening! TIMGUL 4 Life ya heard me! Listen, comment, rant and rave. Let me know if ya friendly neighborhood KOOLASSJOE should keep the music flowing. TIMGUL 4 Life ya heard me! No one brings more fire to the field! Is there any way to make a badge/avatar to discern which MUSIC / MTVMG version was used to make the song being posted? 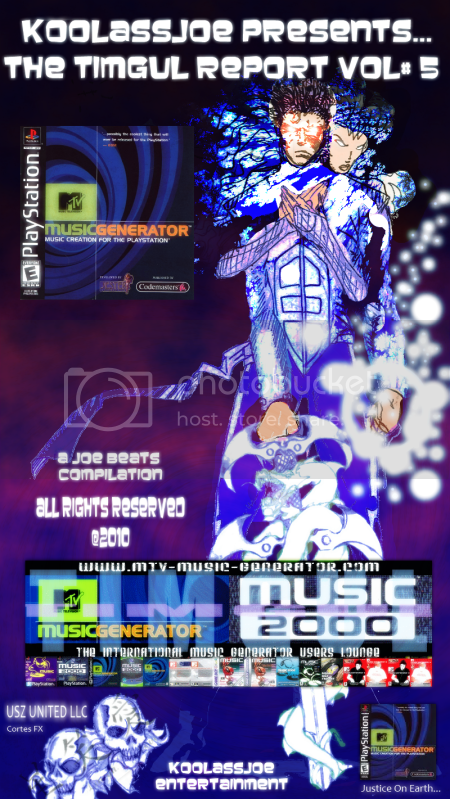 Example being i would start a new topic and i would be able to add the icon of MTVMG1 or MUSIC 2000 into the post. Maybe you could add some simple buttons next to the smiley faces or even replace some of them with MUSIC series icons. I figured most of the time theres the question "what program did you use?" and this sounded like a reasonable idea. Ive read a couple of times that you guys dont have the time to post youtube entries of your songs. Anybody here wants some help in that field let me know. I actually just figured it all out myself and i could help out if anyone needed. i can put a track together with a pic and post em up real easily so let me know! Im not a pro but i can get it done. If its hot blow spot, If not, keep it frosty! 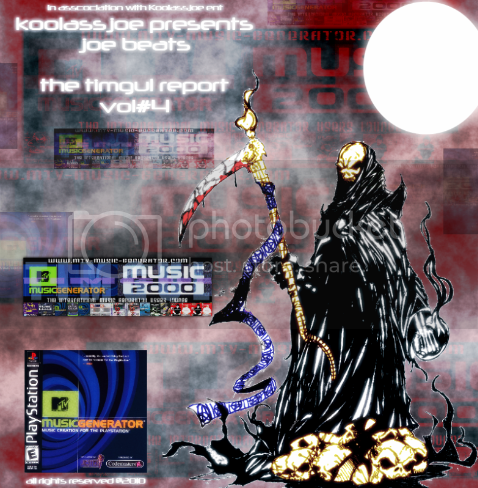 Video Game/Film Soundtracks / Koolassjoe presents... "The Death of Optimus Prime"
Koolassjoe here dropping a track called "The Death of Optimus Prime"
To fill in some history and general rhetoric, ima say this. I wanted to do this beat as a child. This is a rip from Transformers: The Movie. The original animated clasic. The scene when Optimus Prime dies passing off the matrix was a real emotional scene for a kid in my age group during that era. This is twenty somthing years ago people. Back then all i could think about was beat boxing that tune. Well dreams come true. just like the generator. A few years back i sampled that scene and came up with this. I always enjoyed the sound from the movie and i really didnt do much mastering (as with most of my work). Other Music related Discussion / Which commercial software or freeware is the closest clone to the MTVMG? I primarily use a PS3 (Phat) so i can no longer use my copies of MTVMG1. My PS2 is broken and its hard trying to find a PS1 at all. This has forced me to look into the general audio editor supply and i "concur". (lol) Most software is over complicated once u get used to the Generator. I learned how to produce music using an MPC60. Once the Generator hit me, i never looked back. Nowadays im really itching to work but i have no usable platform to work on. I wanted to post up this question in another post but i think it would have been called Necro posting or something like that. "Which commercial software or freeware is the closest clone to the MTVMG? or better yet of all the beat making ways from TIMGUL and its community, what in your opinion is the way you go about making music with the "simplicity" of a generator? To push your thought around, MTVMG1 has been the perfect platform for me even with its restrictions because "I never owned a pc" Till now that is. Nowadays i have "my wife's pc" and an ancient notebook without anything close to making music! Google gets stale after awhile. Ive seached for info but only someone who understands the MTVMG1 or Music 2000(etc...) can answer this question. I havent touched anything like Ablton or FL Studio. I know a little Pro Tools, a little Reason. And a few pieces of Hardware. So what say u? What can give me that MTVMG1 or Music 2000 simplicity? Anything? 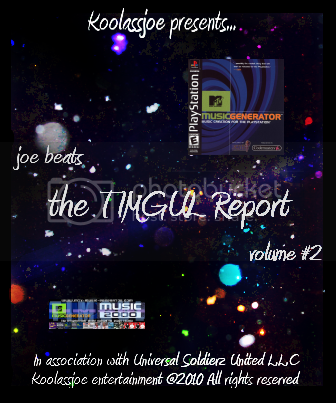 Rap/Hip Hop / Koolassjoe presents... "Joe Rock"
Thanxs to TIMGUL and all its strength! Simple track called Joe Rock. 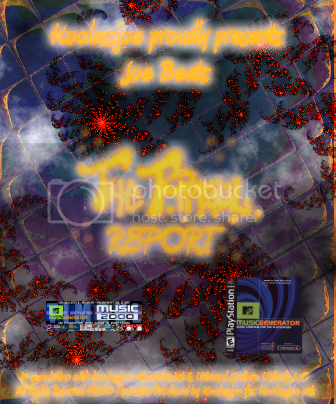 Video Game/Film Soundtracks / Koolassjoe presents... "Xenogears"
Koolassjoe here. TIMGUL 4 Life. This here is a simple track made w/ MTVMG1. Just two loops and some drum work. The game itself is one of ny all time favs called Xenogears for the PS1 back when it was just the Playstation. Squaresoft. It was the battle sequence music and i just was trying stuff out and made this one for a friend who liked the game as much as myself. 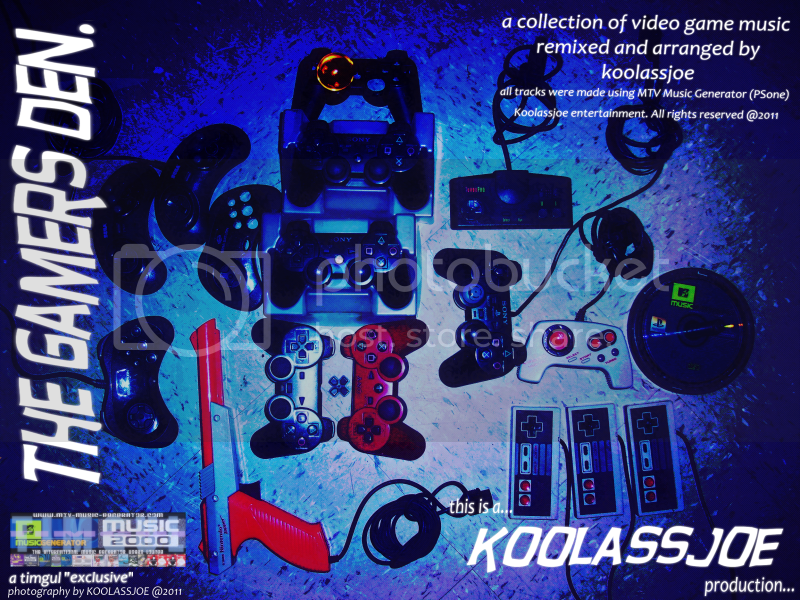 Video Game/Film Soundtracks / Koolassjoe presents... "Zelda"
Whats up TIMGUL? I have two Zelda beats for you! (Well excuse me Princess! Such Memories) I got plenty of games beats. Some too powerful for some mortals to rock! Rap/Hip Hop / Koolassjoe presents... "Dead to the World"
Anyone ever see "Queen of the Damned" with Aaliyah? I get alot of different opinions about that movie. A rock sequel to "Interview with a Vampire". The soundtrack was awesome in my opinion. The scene where Lastant is playing violin on the beach is one of my favorite violin pieces (even though its a Movie). So i sampled it.! Im sorry. I cant help it. Without further nonsense... "Dead to the World" All on MTVMG1. Thanx for Listening! Rap/Hip Hop / Koolassjoe presents... "Kiyoji"
Thanx to TIMGUL and all its glory! This one is called "Kiyoji" Based on the anime "G Gundam" and created w/ MTVMG1. I am an anime junkie. I have made an insane amount of Anime based trax. This track was my first attempt at trying to gain influence with "Cartoon Network" and their "Toonami" lineup. I just wanted to pitch an AMV idea to them so i made this to complement the video. All that ended up being a foolish idea but i ended up having to make copies of this for my friends. Seems like its one of my fav off beat ideas and i made a few others like this with other sources. all the sound came from one episode of the show minus the mtvmg drum kit. I got into AMV production cause of this little beat. Im bringing it to you guys so u can get a feel of what i can think of. Thanx for listening! Rap/Hip Hop / Koolassjoe presents... "Feelings"
The name is Koolassjoe! It took me a long time to post up some sounds but im finally here! This is a MG1 track. Its called "feelings"
Thanks to TIMGUL and all its glory! Been lurking around this site for a long time... I found it on my PS3 but was never able to upload or download anything from its browser. I guess you can group my stuff into the hip hop / anime junkie / emo - Rock category. With that said, hello everybody!